The Government of India has sought to to make out that the the 24 hour ban it imposed on the NDTV India news channel is “quite lenient” compared to what the Inter-Ministerial Committee (IMC), which looked into the channel's “violation” of the Programming and Adverising Code, 1995, amended in 2015, while covering the January 2016 Pathankot terror attack. A Ministry of Defence source has been quoted as saying that the IMC had “in fact recommended a 30-day ban” but, as a “token of warning” the Ministry of Information and Broadcasting “decided” to go in for just one-day ban. The Ministry of Information and Broadcasting's (MIB's) order, issued last Thursday, had said the NDTV India’s reportage revealed “information on the ammunition stockpiled in the airbase, MIGs, fighter planes, rocket launchers, mortars, helicopters, fuel tanks”, causing a potential threat to national security, adding, the coverage appeared to “give out the exact location of the remaining terrorists with regard to the sensitive assets in their vicinity”. The order alleged that NDTV India violated the the Programme Code under the Cable TV Network Rules, 1995, which said, “No programme should be carried in the cable service which contains live coverage of any anti-terrorist operation by security forces, wherein media coverage shall be restricted to periodic briefing by an officer designated by the appropriate Government, till such operation concludes” [rule 6(1)(p)]. Meanwhile, NDTV has reportedly removed all videos of the Pathankot coverage off the internet, though the reports telecast by NDTV, the English channel, remain online. 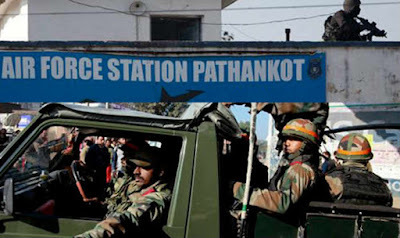 The attack on the Army base in Pathankot, which was headline news and covered by all media, remain online elsewhere, too. Another Hindi channel, Aaj Tak “revealed” how the military operation was going on while the programme was being shot and aired. In live report, the channel's reporter is seen bending and squatting while trying to catch his breath as he talked, with footage being shown from an area that was cordoned off, and where the police personnel were stationed. All the while, firing could be seen on Aaj Tak screen behind the correspondent in Naushera. The Aaj Tak report said, fighter planes were doing “surveillance at night with their visibility lights off”. IBN was no different, say those who have closely monitored these footages. The NDTV in its reply also had argued that the information given out by their reporter was already out in the public domain in newspapers like the Indian Express and the Times of India.